This patient came in with RCT #29 completed 7 years earlier. She reported dull ache, had a gold onlay and obvious apical lesion. 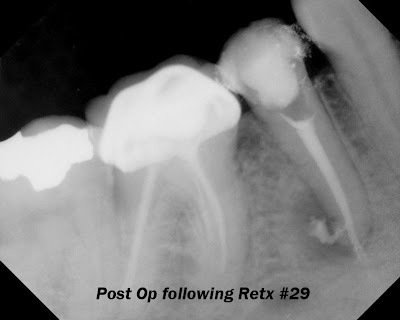 Clinically, tooth was mildly sensitive to percussion, normal probing depths. Diagnosis: Prior RCT with Phoenix Abscess. Retreatment indicated. During retreatment, a lateral canal was opened, irrigated & obturated. No fractures seen under the microscope. At 3 months, the patient was asymptomatic and apical healing noted. This lesion is classified as "healing" due to the decrease in apical lucency since the retreatment. 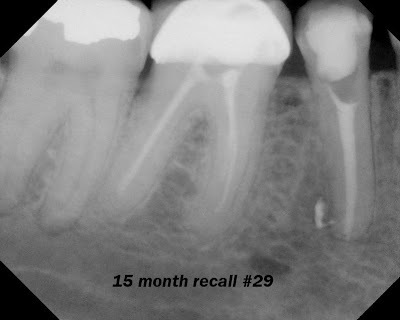 At 15 month recall, the patient is asymptomatic and lesion is "healed", despite failure to place coronal restoration. Swartz, Skidmore & Griffin (1983) in an evaluation of 1007 endodontically treated teeth found that the #1 reason for failure was inadequate restorations. They also found that overfills caused 4 times as many failures. 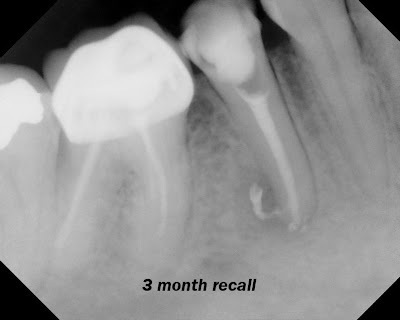 This patient was encouraged to get coronal coverage on this tooth ASAP. Dr. Hales - what is a phoenix abscess? Endodontic diagnosis has two parts to it. A pulpal diagnosis, which is the state of the pulpal (nerve) tissue and a periapical diagnosis, which refers to the state of the tissue around the apex (end) of the root. A complete endodontic diagnosis should give you both a pulpal and periapical diagnosis. 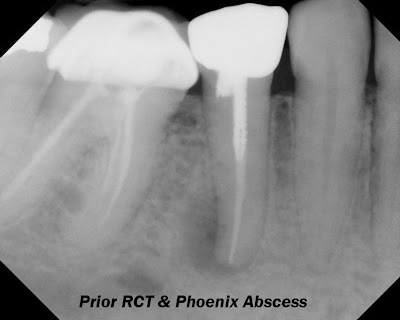 A phoenix abscess is a tooth that is sensitive to percussion and has a radiolucency (shadow) around the end of the root. So if you look at the xray, and the clinical tests that I reported, you will see how I came to that diagnosis. That is a great idea for a future post. I'll work on it! Gotcha - thanks for the explanation! This blog is so great! Thanks so much for posting this. I'm looking for an endodontist in phoenix. If anyone could help me out I would really appreciate it. We have lots of great endodontists in Phoenix. If you go to www.aae.org you can find one close to you.